An abundance of ultra-fine Airy Powder allows this foundation to glide over skin like air for a light finish. Airy Powder also has a soft-focus effect. 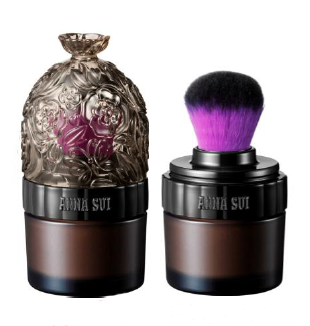 Combined with Anna Sui’s universal base makeup ingredient, Trick Powder, it leaves pores covered, lines softened, and bumps smoothed out for a porcelain finish. Additionally, the plate-like particles of Moisture Plate Powder & Sliding Powder create a thin, even veil over skin for a naturally glowing finish. Beside the Moisture Plate Powder, which consists of particles that have been coated with extremely moisturizing ingredients, leaves skin ultra-hydrated. Additionally, phospholipid-treated Cover Powder avoids the common pitfall of UV-blocking powders (dry & powdery) by coating each particle with oil. This results in a can’t-believe-it’s-powder moisturizing finish that sinks in like a second skin. Formulated with powders that have been coated with highly skin-compatible ingredients, this foundation fits skin like a glove and yields a long-lasting beautiful finish. Additionally, sebum-absorbing powder keeps sweat and oil at bay for a fresh, shine-free look. Available in 7 shades with SPF 20 PA++ and price at S$70. With ROSA CANINA FRUIT EXTRACT, SAFFLOWER FLOWER EXTRACT and ROSA CANINA FRUIT OIL, Lipstick V is Anna Sui’s most vivid and pigmented lip product yet. Its highly transparent base formula ensures pigments show up true and unclouded. The Light Glossy Oil provides lips with a shiny, bouncy finish. An abundance of Melting Moist Oil, which melts at body temperature, ensures a meltingly smooth application on contact. Fix Oil creates a close and comfortable fit while Melting. Moist Oil traps in moisture to prevent dryness. The end result is ultra-hydrated, plumped lips with vivid color that looks freshly-applied all day long. Available in 10 shades and price at S$40. With ROSA CANINA FRUIT EXTRACT, SAFFLOWER FLOWER EXTRACT and ROSA CANINA FRUIT OIL, the two shades swirl with sheer and beautiful pigments fuse together to create a perfectly nuanced shade. 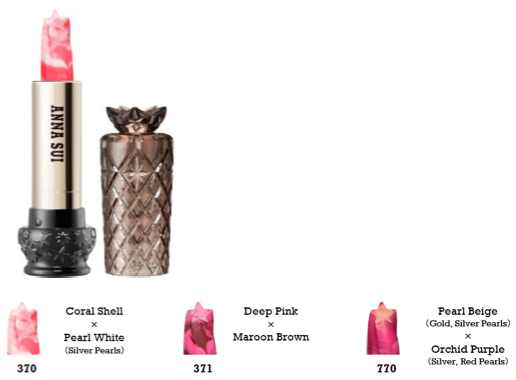 Each application has a slightly different combination of color and shimmer so that lips appear enchantingly different each time. Easy-gliding Clear Sliding Powder and Melting Oil have been combined for a meltingly smooth application with a light touch. Additionally, Fix Oil smoothes out lip lines while Melting Oil provides a hydrating shine so lips are left beautifully lustrous. Fix Oil creates a close and comfortable fit while Moist Oil traps in moisture to prevent dryness. 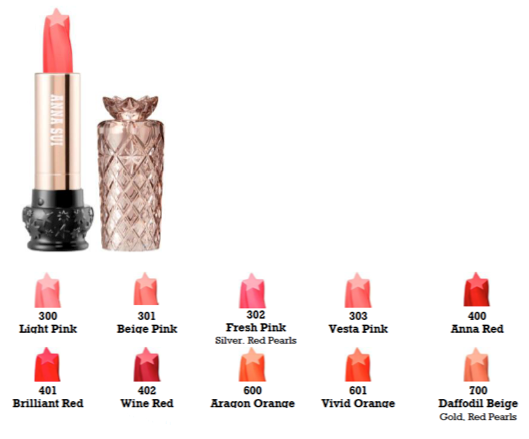 The end result is ultra-hydrated, plumped lips with vivid color that looks freshly-applied all day long. Available in 3 shades and price at S$40. 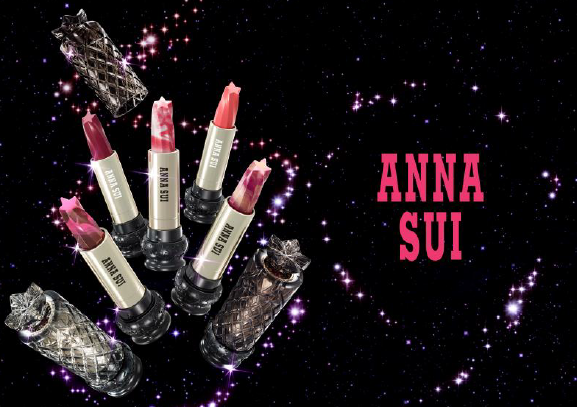 ※Current Anna Sui Lipstick (22 shades) will be discontinued at time of launch. Anna Sui’s Autumn 2014 Collection will be launch in Sep 2014.